So, a strange thing happened this past weekend. I actively bought a video game that I already own. It was Persona 4 Golden, and it isn’t exactly the definition of cheap. But I was feeling nostalgic and wanted the Solid Gold edition to put next to the Persona 5 Take Your Heart edition. And that’s when I realized that I really don’t have that much room left on top of my bookcase. And that’s where I’m getting stuck. Why did I even start this in the first place? Maybe someone more informative on TAY might have the answers I seek. But for right now, this piece is for me to analyze exactly how I got here. So, without any further ado, here’s the trail of crumbs that resulted in the above image. I’m pretty sure this is where it started. I bought Robin and Lucina after becoming enamored with Fire Emblem Awakening. This was my first Fire Emblem game, so I was pleasantly surprised that I enjoyed the plot and gameplay so much that I jumped to buy these two guys. It wouldn’t be until a few months ago that I’d get around to purchasing Chrom, mostly because of being reminded that Fire Emblem is coming to the Switch and surely there’ll be a way to use Fire Emblem amiibo to get my favorite characters into the game. But, yeah, that’s where my amiibo addiction began. I’m certain of it. I’ll be honest, I never played a Witcher game before Wild Hunt. And I only played that after seeing the critical acclaim that the game received. And I’m glad that I did try it out, given my hesitation with RPGs not from Japan. This is definitely one of my favorite games of all time, up there with Chrono Trigger and Persona 4 Golden. I’ve new game plus’d this game five times, and I don’t regret the time I put into this game since each new run unveiled something new in the world I never saw in a previous run. It was around my last new game plus run that I bought the physical version of Blood and Wine. Actually, I bought two, one for the game code, and one for preservation just because I loved the base game so much (as well as Hearts of Stone, the first expansion). Hearts of Stone passed me by before I really fell in love with Witcher 3, but that’s because it wasn’t until Hearts of Stone and how it handled Geralt outside of the main quest that I realized just how in-depth this world really was, but it’s always on my mind. I’d say a sealed copy of Hearts of Stone is next on my list, just so I can complete the set. Also a sealed steelbook of the base game, but man, I don’t know if I can justify those prices right now. Still, every time I see this sealed copy of Blood and Wine, it reminds me of the good times I had with this game. Ah, Persona 5. I fell in love with the Persona series after completing Persona 3 FES. It was a good game with a great plot, but it wasn’t until Persona 4 Golden that I truly became enamored with this series. So when Persona 5 finally came out, I did the fanboy thing and bought the steelbook version of the game. It wouldn’t be until Game Informer’s Extra Life in 2017 that I would obtain the premium edition of Persona 5. At the time, these were sold out, so when Game Informer offered up the premium edition up for auction, I had to bid on it. It’s one of the few auction items I’ve ever bid on during Game Informer’s Extra Life stream outside of the “put a silly hat on an editor” or a Pictionary prompt. And I’m glad I did, because Persona truly is one of my favorite series. So much so that I eventually went back and purchased Persona 4 Solid Gold, which brought me to the realization that I’ve actually begun to collect video games. Still, when I won that auction, I felt a tinge of excitement because I obtained a premium edition as well as donated money to Extra Life. These were bought purely for the nostalgia factor. The NES was my first gaming system when I moved to the US, the first game ever played on it being Kung Fu (hey, I was young at the time). But after years of Atari, the switch to Nintendo’s system was a monumental change. I don’t think there was a difference between the two systems until I played Mega Man 2. It wasn’t until that game that I really realized what video games were truly capable of. The controls, the soundtrack, the plot. Those were things that were absent on the Atari 2600. I’d say this was a seminal moment for me as it comes to playing video games, because it was right after this that I convinced my mother to pay for a subscription for Nintendo Power. The fact that I actively began looking into video games instead of just looking at the box art to determine whether a game was good or not was a large step in my video gaming. And when the SNES debuted, I saved up my allowance to purchase a launch unit. The SNES was the first console I ever bought with my own money, so that’s also a point of nostalgia for me. Also, the SNES was a pretty great console. One of my latest acquisitions. If you’ve been following TAY! Weekend!, you know how much time I sank into this game. I’m still playing it in point of fact. It’s a new game plus run, but given how huge this game is, I’d say I’ve easily put in over 100 hours into this game. It wasn’t until the DLC for Xenoblade Chronicles 2 came out that I bought this. I wanted a physical copy of Torna: The Golden Country, so when I saw this sitting behind the counter that I realized that I had to have it for my collection. It was at this point that I had an inkling that I was actually collecting games because of my love for them. And this was the purchase that made me think about Persona 4 Solid Gold. Still, I don’t regret purchasing this special edition, because this game gave me a lot of entertainment as well as justifying my purchase of a Switch console. 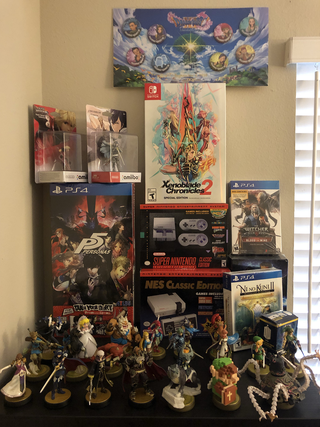 Breath of the Wild might have been the game that initially got me to purchase the Switch, but it wasn’t until Xenoblade Chronicles 2 that the Switch became a viable console for me. And we come full circle with the reason for my composing this post in the first place. It wasn’t until I was holding this in my hands that I realized that I could have purchased this when I bought the Vita to play Persona 4 Golden in the first place. The Gamestop employee asked me if I wanted the collector’s edition or the regular edition of Persona 4 Golden, and I chose the regular version because I was buying a Vita, a proprietary memory card, and a copy of the game at the same time, and at the time, I couldn’t justify purchasing the collector’s edition. Which is somewhat silly now that I think about it, because I actually purchased this for well above the MSRP. And that’s where I realized that I’m actively purchasing video games for the sake of collecting them. And while I don’t regret purchasing this, I guess the reason why I’m posting this is to ask for advice for those of you that do collect games. What rules do you have in place when it comes to building your collection? Because with this latest purchase I realized that I’m going to have to set some ground rules from here on out, because while I enjoy the little collection that I’ve amassed thus far, I’m not willing to have it take over my livelihood. So, what tips/rules do you abide by? If you’ve gotten this far, thanks for reading. But like I said at the beginning, I just needed to get this out in writing to reconcile how I got here in the first place.